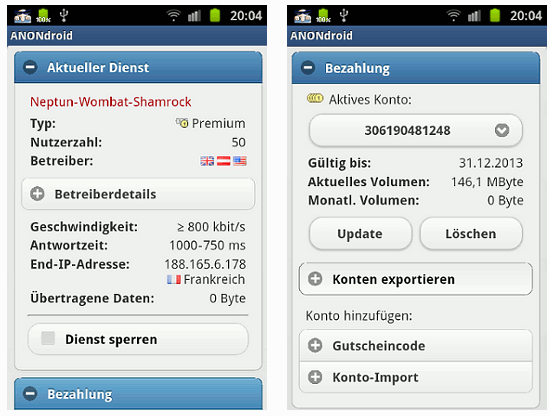 ANONdroid is a JonDonym proxy client for Android smartphones. This nice piece of software is under ongoing development by the AN.ON project of the university Dresden. Project leader is Dr. Stefan Köpsell. ANONdroid uses the core libraries of JonDo with a smartphone compatible GUI. ANONdroid acts as a proxy for your internet applications and will forward the traffic of your internet applications encrypted to the mix cascades. It is still under development, but a first version is ready for download from the Andoid market. a secure browser configuration is important for anonymous surfing we recommend the use of Orweb browser. It is a browser for Orbot, but can be used with ANONdroid too. After installation you have to change the proxy settings of Orweb to localhost:4001. When you start the JAP client program, JAP first connects to the InfoService to check if the program version is still current. If the version of the program is no longer compatible with the software of the mix, the user is automatically offered a program update, since otherwise the JAP service could no longer be used. In the next step, JAP registers with the first mix station of the chosen mix cascade. A permanent network connection between JAP and the first mix station remains until logoff. On installation of JAP, the user already configured the web browser so that each packet of data sent goes through JAP instead of directly to the internet. JAP encrypts the data and sends it to the first mix station. The first mix station then mixes the data with that of other users and sends it to the second mix station which passes it on to the third mix station which decrypts and sends the data through a cache proxy to the internet. Each mix carries out cryptographic operations on the message so that the JAP-encrypted data is only readable when it's gone through the proper mixes in the proper order. That way it's insured, that an eavesdropper either only receives unreadable (encrypted) data or can no longer determine the sender. In order for it to work correctly, only one mix in the cascade need be trusted not to inform the eavesdropper as to the method of message mixing. Here is a description of the exact method of encryption.